The Art of LEGO Scale Modeling displays amazing, fan-built LEGO recreations of real-life vehicles, showing off every amazing detail with high-quality photographs. You'll love poring over dozens of models, including Formula 1 racers, construction vehicles, ships, trains, airplanes, and all kinds of trucks. 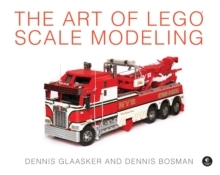 Authors Dennis Glaasker and Dennis Bosman share their own impressive LEGO models as well as highlight models from builders around the world. The Art of LEGO Scale Modeling also includes tips and tricks that describe the design and building process.